This recipe was slightly adapted from a recipe found at Marthastewart.com. 1. In stand mixer bowl, combine 1/4 c warm water and yeast. Let sit 10 minutes. 2. Add flour, sugar, salt, 3 tablespoons melted butter, milk and remaining water. Mix, using the paddle attachment, on low speed for 1 minute. Change to dough hook, and mix on medium-low speed for 7 minutes. 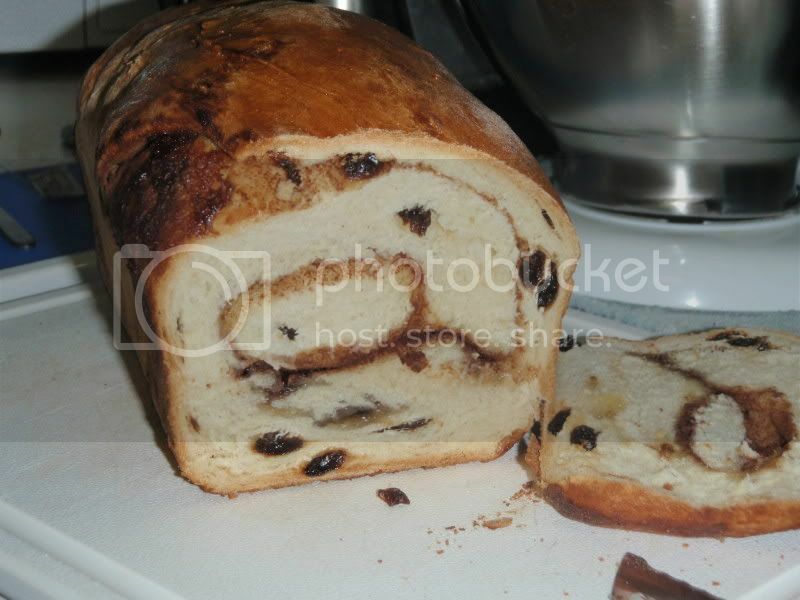 Add raisins, and mix on medium-low speed until dough is firm but not dry, 3 minutes. 3. Transfer to a lightly floured surface, and knead by hand into a ball. Place dough in a large bowl coated with cooking spray, turning once to coat. Cover with plastic wrap; let rise in a warm place until doubled in bulk, about 1 1/2 hours. 4. Spray two 9-by-5-inch loaf pans with cooking spray, and set aside. In a small bowl, combine sugar and cinnamon, and set aside. Transfer dough to a lightly floured surface, and cut in half. 5. Roll 1/2 if the dough into a 10-by-12-inch rectangle. Brush with half of the beaten egg, sprinkle with half the cinnamon sugar, and drizzle with half the melted butter. Roll up dough tightly, shaping into cylinder. 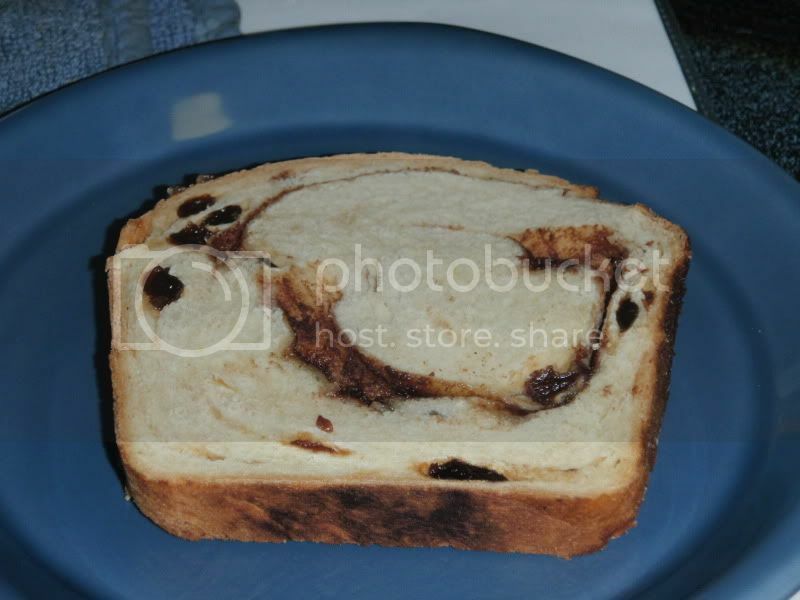 Place in a loaf pan. Repeat with other half of the dough. 6. Let loaves rise in a warm place for an hour. Thirty minutes before this final rise is completed, place a baking stone, if using, in the lower third of oven. Heat oven to 425 degrees. 7. Brush tops of loaves with egg white. Bake 15 minutes; lower oven to 400 degrees, and bake 15 minutes more. Remove from oven; cool on a wire rack for at least 30 minutes before slicing.